SAW045966 SCOTLAND (1952). 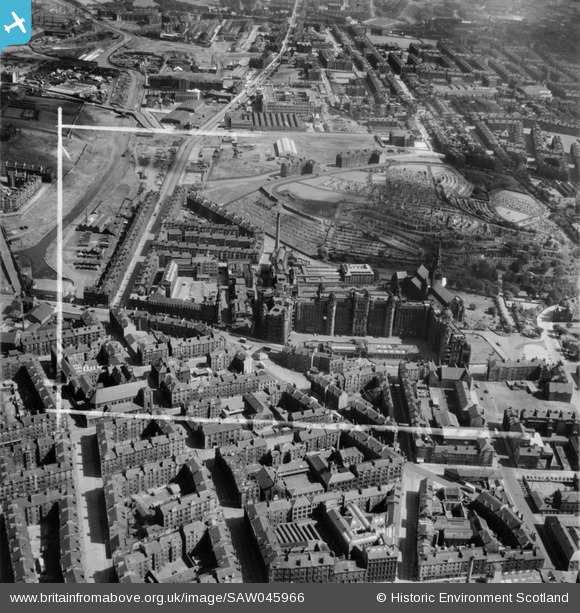 Glasgow, general view, showing Royal Infirmary and Glasgow Necropolis. An oblique aerial photograph taken facing east. This image has been produced from a crop marked negative. Title [SAW045966] Glasgow, general view, showing Royal Infirmary and Glasgow Necropolis. An oblique aerial photograph taken facing east. This image has been produced from a crop marked negative. Necropolis Gates ~ The gates to the Necropolis looking out towards Cathedral Square, photographed in the early 1900s. The gates were installed in 1833 to provide access to the "Bridge of Sighs", which carried the carriageway from the square across the Molendinar Ravine to the Necropolis. They were designed by James Hamilton, whose father David designed the bridge, and were cast at Thomas Edington & Sons' Phoenix Foundry in Queen Street. St Mungo Museum of Religious Life and Art. Wills cigarette factory on Dennistoun's Alexandra Parade. Opened 1953.